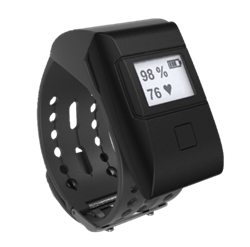 Oxitone Medical (Oxitone), an Israeli-based medical device and digital health company developing wearable monitoring solutions to transform delivery of chronic disease home care, has received 510(k) clearance from the FDA for its wrist-sensor pulse oximetry bracelet Oxitone 1000. The wrist-sensor pulse oximeter Oxitone 1000 measures critical vital signs such as SpO2 and pulse rate with the same precision as conventional fingertip pulse oximeters. Oxitone 1000 becomes the first to market a wrist-sensor pulse oximeter that offers comfortable real-time monitoring with high patient compliance. More than 20 million Americans suffer from cardio-pulmonary chronic diseases that cause more than 420,000 deaths a year, and these numbers are growing. Seamless real-time monitoring of chronic patients is critical to clearly observe clinical status, recognize variations from the norm and, as a result, to avoid costly and deadly exacerbation. Traditionally, home monitoring of chronic patients includes uncomfortable and bulky fingertip spot-check pulse oximeters that cause low patient compliance. The history of failed efforts to measure blood oxygen at the wrist has been changed by the proven Oxitone biosensors technology, the only solution to have reliable SpO2 reading at the wrist. Oxitone’s technological solution, protected by five patents, enabled building the world’s first biosensor that exploits the wrist anatomic structure as a quasi-optical element. At the same time, the bracelet's patented mechanical configuration encompasses springs and dampers for ergonomic fixation of the sensors unit which isolates it from wrist movement and topographical variations. The Oxitone solution has been validated in pilot studies in a number of medical settings including desaturation labs. The results have proven almost 100% patient satisfaction, significant reduction of medical staff workload and a potential for major reduction in readmission. Oxitone FDA clearance paves the way towards supervision of patients beyond hospital walls while providing the hospital’s medical-grade level of care. Oxitone is an Israeli-based medical device and digital health company focused on developing cutting edge wearable and digital medical technologies for medical systems, clinics, nursing homes, telemedicine companies, payers and providers. The flagship product is the world’s first FDA-approved wrist-sensor pulse oximetry bracelet Oxitone 1000. The company is a participant in StartUp Health and Texas Medical Center (TMCx) startup accelerator programs.